The easy-to-use yet powerful photo editing app for Android, Snapseed, has been updated with several new features this week. The updated build, version 2.8 for those keeping score at home, brings users the ability to add text to their photos in a wide range (dozens) of styles. The new feature is listed under tools in the app and when you tap it, you will see a wide variety of styles to chose from for your text. Once you type in your text (by tapping the text on your photo), you can move it around within the photo for effect or for location. It’s quite powerful and certainly adds a nice touch to your photos. social networks like Facebook or Google+, you may want to lower that output size for speed up upload. Now you can do that by going to the Overflow menu and selecting the Output size for sharing. You can leave it at full resolution or you can adjust it down to 4000 px, 2000 px, 1920 px, 1366 px or 800 px. Once you set this it will remain the same for all of your output sizes. If you want to readjusted it, you need to come back to this menu in the app. Snapseed also noted in the release notes that there were a few minor UI tweaks (of which I’ve not found… I don’t think so at least) and overall performance improvements. 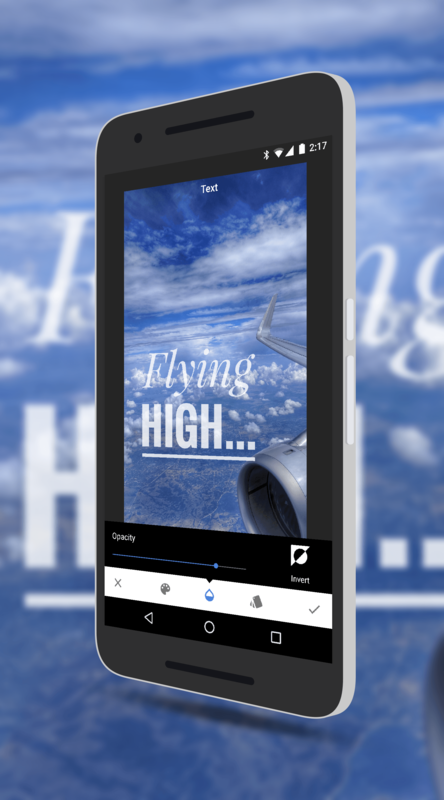 Snapseed is a free app in the Play Store and one of the easiest photo editing apps you will find. It’s not a Photoshop but for editing photos on the fly from your phone or tablet, it’s hard to beat.